I was cleaning and organizing when I came across a bunch of old family photos that I needed to scan, repair and preserve. This one is one of the better ones. 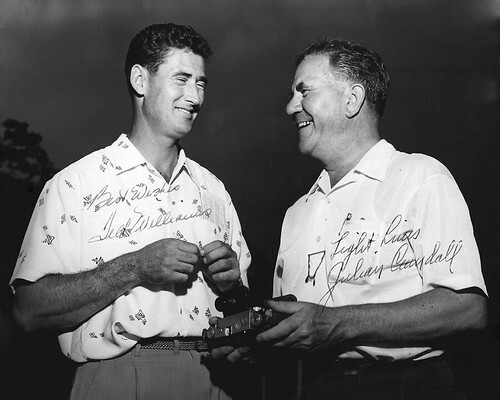 It is a photo of Ted Williams (the baseball player) and my grandfather Julian Crandall. We think it was taken sometime in the 50’s during a tarpon fishing trip to Florida. My great grandfather and Ted were longtime friends and fishing buddies. I actually got to meet Ted when I was a kid and going to Ted Williams baseball camp for the summer. I even have his autograph on a baseball. Jack and I went to Maine with plans to fish in the ocean but we ended up fishing freshwater with great results. In addition to the trout we caught 10 bass and twelve inch white perch. We fished in both Biscay Lake and McCurdy Lake. Until this year, I had not done any freshwater fishing in the Pemaquid region. I knew about Biscay Lake from taking my Kayak lessons there two years ago. We found McCurdy lake just looking at maps and riding around on the back roads looking for access to water. I have been reading a lot of bad reviews about this summer’s superhero and sequel movies. Namely the Pirates of the Caribbean, Spiderman 3, and The Fantastic Four:Rise of the Silver Surfer. The rest of At World’s End left me at wit’s end wading through nearly three hours of punishing exposition, endless blather (pirates take meetings — who knew? ), an overload of digital effects and shameless setups for Pirates 4. I heard a discussion about Spiderman 3, on the Free Beer and Hot Wings morning radio show. They thought that the writers tried to cram too many storylines in to the movie and did do any of them well. That was my impression from checking out the Website. An MSNBC review made the same comment about too many storylines for one movie. I’m a big Spiderman fan and was hoping for a good film, so the poor reviews are disappointing. Rolling Stone called the new Fantastic Four movie a “plotless, brainless, witless bore.” I have read numerous other reviews that made similar comments. If you are into action movies, Live Free of Die Hard is an upcoming sequel with potential. So far, it has been a disappointing summer for sequel movies. Do you agree with the critics about these films?